The Bahá'í Faith is a monotheistic religion founded in Persia, emphasizing the spiritual unity of all humankind. There is no one official religious symbol representing the Bahá'í Faith, but some symbols is commonly used. 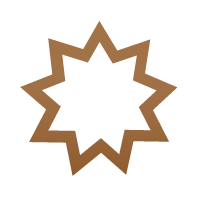 The simple nine-pointed star is generally used by Bahá'ís as a symbol of their Faith. The number "nine" is significant for Bahá'ís for several reasons. The number nine has significance in the Bahá'í Revelation. Nine years after the announcement of the Báb in Shiraz, Bahá'u'lláh received the intimation of His mission in the dungeon in Teheran. Nine, as the highest single-digit number, symbolizes completeness. Since the Bahá'í Faith claims to be the fulfillment of the expectations of all prior religions, this symbol, as used for example in nine-sided Bahá'í temples, reflects that sense of fulfillment and completeness.The Arabic alphabet can be used to represent numbers, attaching a numerical value to words. The numerical value of Bahá is 9.